Chicago Bulls, 1995-1996. Finished with a 72-10 record, the best of all time. Michael Jordan, Scottie Pippen, Phil Jackson on the sidelines. The best basketball team ever assembled. The beginning of the second three-peat. On it, the greatest defensive player of all time south of Bill Russell, Dennis Rodman. Just over two months ago Dennis Rodman was inducted in the Basketball Hall of Fame. A unique talent, which always seemed out of place, on the court and off it. When the screws were bolted tight, he was a fantastic basketball player. Could guard anyone, 1-5. The best rebounder since the Chamberlain – Russell days. An awkward offensive scorer, but his ability to keep plays alive with his hustling and offensive rebounding were worth at least 10 points a game. 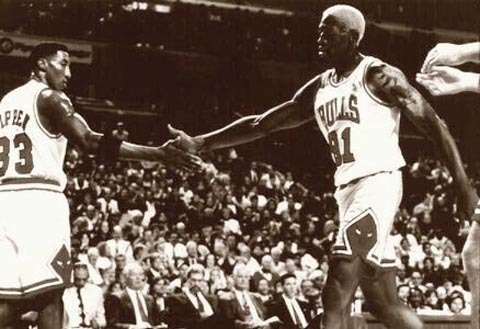 Maybe the best one game example of Rodman’s ability is this Youtube video from a playoff game between the Chicago Bulls and the Orlando Magic in 1996. Shaquille O’Neal usually toyed with the Bulls’ Center committee, never a quality bunch. Rodman however, is no man to toy with. A 13 point – 21 rebound effort from “The Worm” in an electrifying playoff performance.